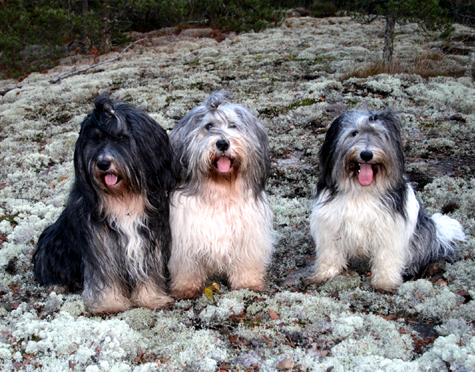 The Polish Lowland Sheepdog (PON) is a robust sheepdog with roots in Tibet. In fact, it is said that the heavy fur which covers the eyes of this sheepdog is a natural adaptation to the glaring sunlight of the region. 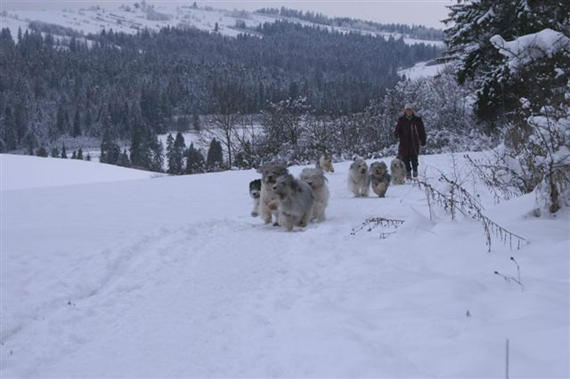 Nomadic tribes traveled with the ancestors of Polish Lowland Sheepdogs during their migration to European countries and the breed became established among the local population. Polish Lowland Sheepdogs developed a reputation for hard work, loyalty and strong herding instincts. The breed's herding instincts have survived for centuries and even today, they still need a job and will attempt to herd their human families in the absence of sheep. Polish Lowland Sheepdog (PON) lovers will appreciate reading the PON Digest online publication to learn more about this beloved breed. Klingi, Milou, Lani in Finland - February is love a PON month ! A warm welcome to international PON Lovers ! on all aspects of PON care and life styles. February FAQ about PONS You've always wanted to know! February-PON Horoscopes - Which Astrological Sign belongs to your PON ? Practical information to help PON Lovers raise their furry family members ! Winner of the Paris Dog Show. She is only 19 months but has 12 BOB! 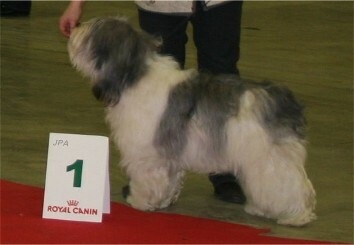 She has won all shows since she is in adult class ! with at the moment 21.992 PON's including a lot of pictures. The program I'm using is Pedserve. Give Your PON the best life has to offer - for FREE !! Learn about the best ways of caring for your PON's paws during cold weather months. When your PON is scheduled for a tooth cleaning or any other surgical procedure which requires anesthesia, it is of utmost importance that food is withheld at least twelve hours prior to surgery. Not only will this prevent your PON from vomiting and inhaling stomach contents during surgery, but it will also reduce nausea as your PON regains consciousness. This advice is vital for the well being of your PON and needs the co-operation of all family members. Keep your Pon's gums healthy with cranberries ! The human health benefits of cranberries have been recognized by medical science for decades. Now the cranberry industry hopes the nation's millions of pet owners will apply the same concept to their beloved cats and dogs. Does your PON suffer from arthritis ? Green lipped mussels for alleviating arthritis in dogs. Green-lipped mussel (Perna canaliculus) is a New Zealand shellfish, from which an extract has been shown to be useful in the treatment of rheumatoid arthritis and osteoarthritis . Green-lipped mussel inhibits inflammation in the body. Although inflammation is normal under certain conditions, consistent inflammation can result in pain and damage to the body, including the joints. The concepts of Yin and Yang contributed to the Chinese scientific system, particularly in fields like biology and medicine The organs of the body were seen to be interrelated in the same kinds of ways as other natural phenomena, and most understood by searching for cause and effect. Illness was seen as a disturbance in the balance of Yin and Yang caused by emotions, heat or cold, or other influences. Therapy thus depended on accurate diagnosis of the source of the imbalance. 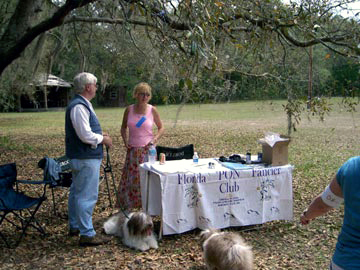 PON owners can readily apply Yin and Yang to their management of PON nutrition and ultimately to solving digestive issues. Polish Lowland Sheepdog owners need to be informed ! into an unconscious human. A similar technique can also work effectively on dogs. from drowning, choking, electrical shock, or a number of other situations. European sources have confirmed the effective use of vinegar for flea control. To be sure of complete protection, please spray often (every hour) and pour a small amount of apple cider vinegar into your PON'S drinking water on a regular basis. If you are one of those conscientious PON owners who have spent untold amounts of money with your local veterinarian for gunky ear problems, then it is high time to take matters into your own hands and look further than expensive veterinary ear solutions and ear cleaning sessions at your vet's office.What are the main causes of canine ear problems ? Most veterinarians will agree that the most common underlying causes of ear problems in dogs are allergic reactions (inhalant and food allergies). Scientifically based research is warmly welcome. Please click on the above graphic. Simply type in a Polish or English word you would like translated. Informative articles and photos' are warmly welcome. 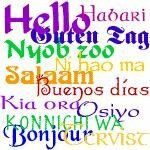 PON Health Forum is a bi-lingual discussion list. and educational purposes. This is in accordance with Title 17 U. S. C.
Information on this web site is intended for informational purposes only. Nothing on this publication is intended to be a substitute for professional veterinary care. Please consult your veterinarian for all health issues. Copyright 2008 - www.pondigest.com All rights reserved for images on this site. 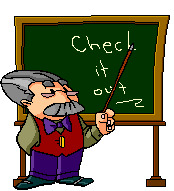 Written permission must be obtained to reproduce all images and articles published on this site. Violators will be prosecuted to the full extent of the international copyright law.